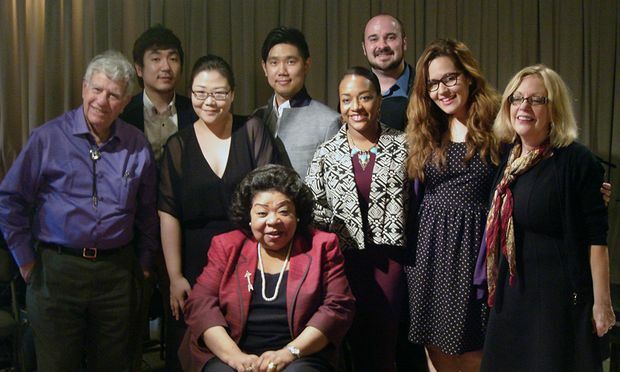 Soprano Martina Arroyo (center) with host Bob Sherman and students from Arroyo's Prelude to Performance program. Soprano Martina Arroyo won the Metropolitan Opera Auditions in 1958. When the Young Artists Showcase began two decades later, Arroyo was a star at the Met and toured the world’s best opera houses. Nearly 10 years ago, Arroyo began a program to teach young singers how to inhabit an opera role. The Martina Arroyo Foundation’s Prelude to Performance is an intensive summer program that presents fully staged performances of complete operas with orchestra and chorus. In this special episode of the Young Artists Showcase, Arroyo joins host Bob Sherman and six students from her Prelude to Performance program in the WQXR Studios. They perform excerpts from La Fille du Régiment and Madama Butterfly. These singers will be performing full productions of those operas at the Danny Kaye Playhouse at Arroyo’s alma mater, Hunter College. Donizetti: La Fille du Régiment, "Chacun le sait, chacun le dit"
Donizetti: La Fille du Régiment, "Ah! mes amis, quel jour de fête"
— Brandie Sutton, soprano; Taehwan Ku, tenor. Puccini: Madama Butterfly, "Che tua Madre"
Puccini: Madama Butterfly, "Addio, fiorito asil"
Puccini: Madama Butterfly, "Io so che allo sue"
— Taehwan Ku, tenor; Hyona Kim, mezzo-soprano; Young Kwang Yoo, baritone.